The human brain has over 100 billion neurons that are linked together by a complex network of nearly 500 trillion synapses. These synapses are physical gaps between neighboring neurons that enable them to connect with each other when an electro-chemical reaction occurs. Think of it like two electric wires placed close to each other, but not actually touching. When electricity flows through one wire, it will arc across the gap to the other wire and complete the circuit. Even though the wires are not physically connected, the arc “connects” them when the electric current crosses the gap. The patterns by which these neurons connect with each other produce what we perceive as thought. There is one connection pattern for the thought of dog and a completely different connection pattern for the thought of cat. The image to the right is a simplified view of what this looks like. 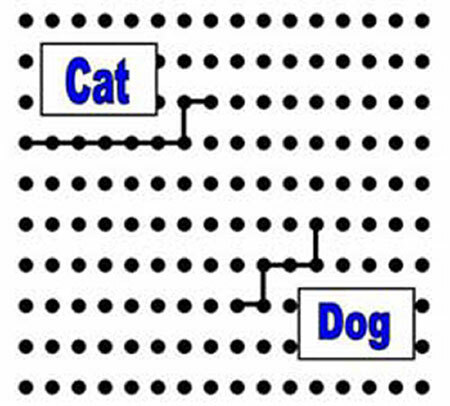 The dots are neurons and the connection patterns represent what happens in the brain when we think of either dog or cat. Once a connection is made between neurons, they become pre-disposed to connect in that same way in the future. The more times the neurons connect in that pattern, the more likely they are to connect in that same way again. Although there are many similarities between human thought and a computer program, it is important to realize there are significant differences as well. A computer program is a sequential set of steps or tasks. Once the first task is completed, the computer moves to the second one. Once the second one is completed, it moves to the third and so on until it reaches the end of the program. Because the computer can complete each task quickly, it can move through thousands of tasks in a few seconds. Other neurons fire to create connection patterns for everything from our past experience associated with the thought of dog. Some may see of a white, cuddly poodle. Others may visualize a strong, aggressive Pit Bull. Some may have a memory of getting a puppy as a Christmas gift. When this person thinks of dog, neurons fire to create patterns for a what the puppy looked like, it’s name (Buster) and several memories of playing together in the backyard. This person would also associate the thought of dog with Christmas, family, happiness and love. Each one of these additional neural connection patterns will be more or less vivid than the others. More or less emotionally charged. The predominant associated patterns will determine our overall response to the thought of dog. They won’t be the ones we experienced most recently, but the ones we visualize most vividly. The ones that are the most emotionally charged.The image to the left represents what this would look like. 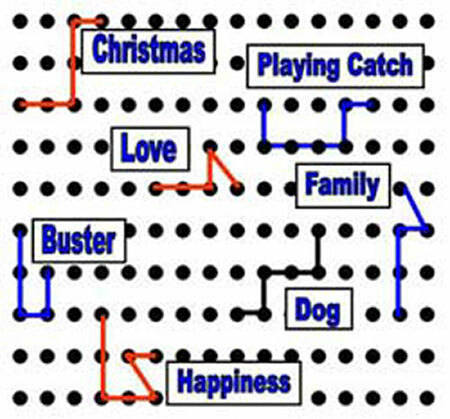 Using the initial thought of dog as a baseline, the blue neural connection patterns are less vivid and the red ones are more vivid. This person’s predominant neural association patterns are Christmas, love and happiness. This person would experience pleasurable emotions when thinking of dog. (All thoughts have corresponding emotions.) This person would “like” the thought of dog. Now consider what the neural connection patterns look like if this person had a traumatic childhood experience with a dog. When he was six, the neighbor’s dog bit him. Instead of Christmas, love and happiness, the predominant neural connection patterns would be terror, fear and pain. The only way to overcome this is to interrupt and replace the neural association patterns, but how do you do that? Even if this person KNOWS these feelings are unrelated to the present moment. This person UNDERSTANDS that the dog bite happened years ago. This person could use affirmations and positive thinking from now until the end of time, but would still FEEL the same EMOTIONS.